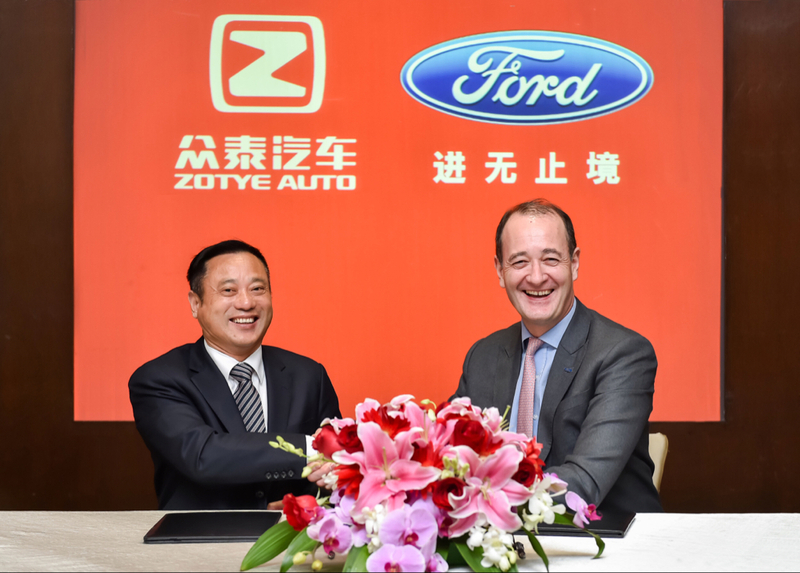 Ford Motor Company in China has signed a new 50/50 joint venture agreement with Zotye Auto to establish Zotye Ford Automobile Co., Ltd. – a firm to design, manufacture, market, and sell pure-electric vehicles in the Asian country under a new brand. Ford Asia Pacific President Peter Fleet and Zotye Auto board director Ying Jianren signed the agreement Wednesday in Beijing. The joint venture is still awaiting regulatory approval. Assuming it goes through, it will be funded initially by a combined investment of 5 billion RMB (about $754 million US). A Zotye Ford product research and development center, a manufacturing plant in Zhejiang Province, and a dedicated sales and service network are all in the plans. Beyond EVs, Ford and Zotye further plan to explore offering mobility services to the Chinese market. Zotye Auto is no industry lightweight, currently leading in China’s pure-electric small-vehicle segment. According to Ford, Zotye has sold more than 22,500 pure-electric vehicles this year through October, representing 14-percent year-over-year growth.